Ragi malt makes a perfect breakfast item. A hearty and very nutritious breakfast and that which keeps you full until lunch. This version is ideal for those suffering from Diabetes. 1.Slightly roast the powder first in medium flame till aromatic, around 3-5 minutes. Make sure you don't burn the powder. This step is to eliminate any raw smell from the porridge. Set aside. 2.On the other hand take a saucepan and heat the water till lukewarm. 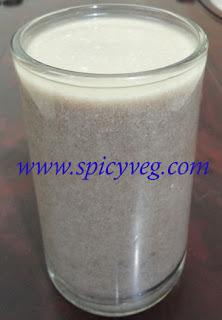 Add the Ragi powder to the water. 3.Keep stirring until it gets well mixed. Add salt to it. 4.Bring to a boil.Switch off the flame and let it cool for some time. 5.Add Buttermilk. You can add more or less butter milk depending on your taste.